The Treaty of Schönbrunn had put France & Russia near each other in Poland, and this caused an already tense relationship between the 2 leaders to get worse. The Russians were worried that French control of Warsaw was a step towards an invasion of Russia, so the Russians started to plan to attack them to take control over Warsaw. The French, like usual, acted like they were freeing the people here, helping the Polish gain their freedom from Russia. As relations became more tense, the Russians would withdraw from the continental system because they really needed the money from trade. This decision was a clear break from the French, and both sides knew it would eventually lead to war. The Grande Armée under Napoleon would invade Russia with nearly half a million men (some say as much as 700,000). The Russians had nearly as many men but most were ragtag militias instead of well trained troops. Napoleon called this the 2nd Polish War as a justification for the invasion, claiming he was freeing the Polish people. He openly ignored the advice from his men about the invasion being a poor idea and went anyway. The French continued to win early battles, but that was partially because the Russians were avoiding major battles on purpose. The Russians used scorched-earth tactics, burning any area that might help the French, which made it impossible for the French to forage for supplies like normal. The weather in Russia make things more difficult for the French, as it varied between rainy and dry seasons. The rainy seasons would have men sinking in the mud, and swamp-like conditions led to tons of dysentery and the flu. As the rainy season ended the roads would dry with huge ruts in the road, that made it difficult to move supplies. Men who fell behind would harass the local people for food and supplies, but they would turn public opinion against the French by their actions. It would have been possible for Napoleon to get a lot of help from the Russian serfs, but they also would turn on him when he claimed he wouldn’t free them if he was in charge. The invasion would slow down as the French got closer to Moscow, since the Russians quit retreating and prepared to fight. Over a quarter of a million troops would fight in the Battle of Borodino (1812) outside Moscow. This would become the bloodiest battle of the Napoleonic wars (possibly bloodiest ever to this point) with 70,000 casualties. The Russians eventually decided to make a tactical retreat and allow the French to take the city, believing this was the only way to preserve their army. 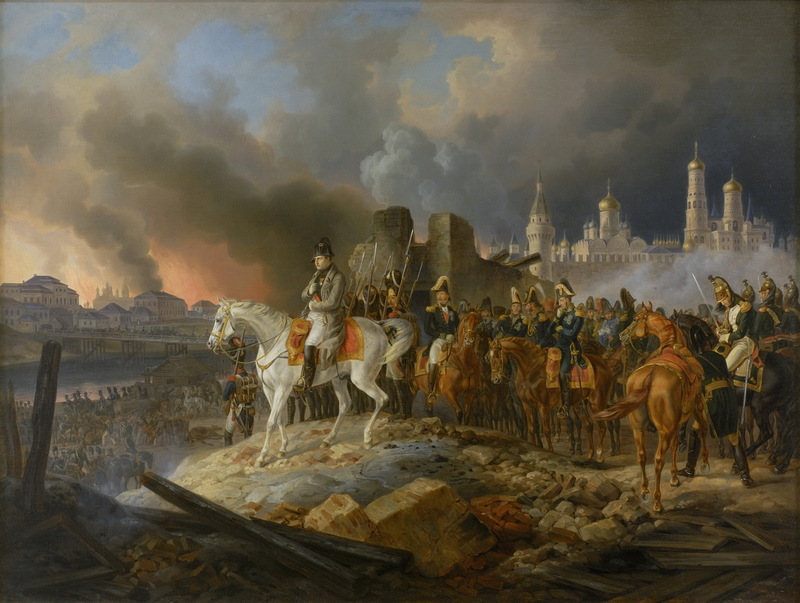 Napoleon believed that the Russians would surrender once the city of Moscow fell, but the reality was that St. Petersburg was the more important city to most Russians (spiritual capital). The Russian army would strip the city of all supplies as they left the city so that the French wouldn’t be able to use any of the supplies there. They also released the prisoners from jail to allow them to make trouble for the French in the city. Lastly the Russians started a major fire on the first night the French were there. Over 80% of the city would burn that night since there was nothing left to stop the fire within the city. The Russians also put tons of flammable things all over the city to help spread the fire, knowing it would only make it harder for the French.